Omaha Poker is catching on in popularity online as many Texas Hold’em players want to try something different that requires learning a new set of rules and poker strategy to win. The natural move is to Omaha and learning the game certainly adds a new skill set to your poker talents. This guide will show you everything you need to get started playing the game. If you want to play in the popular H.O.R.S.E. tournaments, this is one of the games you’ll have to master and we’ve put together a guide to Omaha Poker strategy that will kick-start you playing skills. Of course there is another good reason for learning Omaha. There are fish aplenty at the tables, just waiting to be beaten as many players really haven’t mastered the skills required to play. Work through the range of articles on offer and catch those fish! 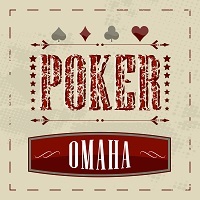 We hope you enjoy these Omaha Poker Strategy articles and rules guides. Feel free to refer back to them when playing to sharpen your skills or check which strategy you should employ when playing. Omaha is one of the most interesting poker games so you should at least try it for a few games and give it a chance. It is different from Texas Hold em but much more rewarding when playing, especially if you’re playing well. Even if your a real player, it’s worth playing for free for a while to learn the game and find out how to employ the correct strategy in your play.